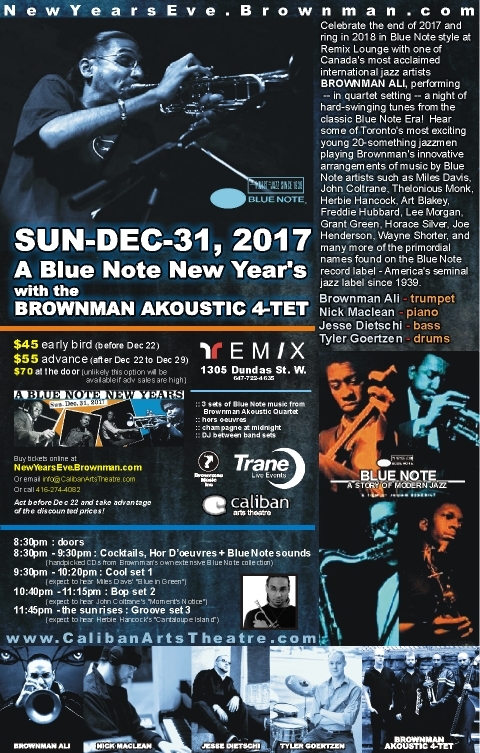 A Blue Note New Year's 2017 w/ BROWNMAN AKOUSTIC QUARTET feat. Brownman Ali, Nick Maclean, Jesse Dietschi & Tyler Goertzen. A Caliban Arts Theatre presentation. 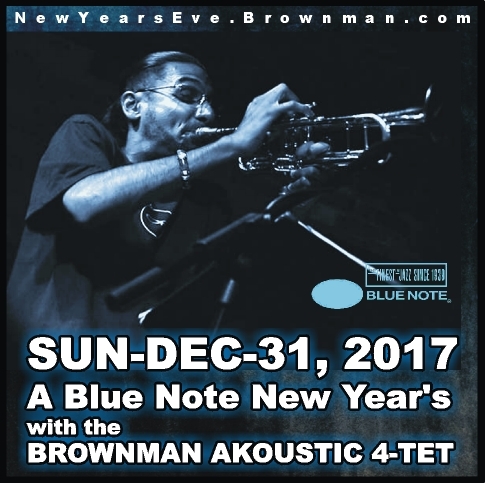 "Celebrate the end of 2017 and ring in 2018 in Blue Note style with one of Canada's most acclaimed international jazz artists Brownman Ali performing -- in quartet setting -- a night of hard-swinging tunes from the classic Blue Note Era at Toronto's Remix Lounge. 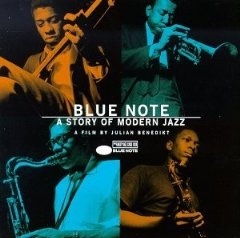 Hear some of Toronto's most exciting young 20-something jazz men playing innovative arrangements of music by such as Miles Davis, John Coltrane, Thelonious Monk, Herbie Hancock, Art Blakey, Freddie Hubbard, Lee Morgan, Grant Green, Horace Silver, Joe Henderson, Wayne Shorter, and many many more of the names found on the primordial Blue Note Records label -- America's seminal jazz label since 1939. 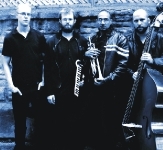 The ensemble will begin with swing classics and slowly, over the course of the night, start to interpret them in the contemporary jazz fashion the Brownman Akoustic Quartet has become renowned for. As the night gets funkier, by midnight, expect it to be a full on jazz-funk New Year's party you won't want to miss!" 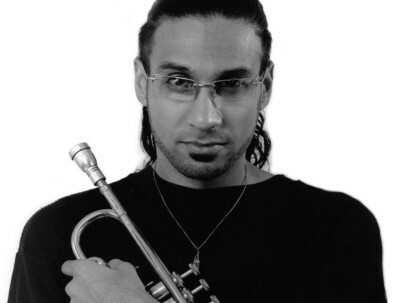 About Brownman - Heralded as "Canada's preeminent jazz trumpet player" by New York City's Village Voice magazine, winner of 2 National Jazz Awards, 4 Independent Music Awards, a CBC Galaxie "Rising Star" Award and named "one of the top 10 reasons to visit Toronto" by Air Canada -- Brownman is widely regarded as a vanguard for the evolution of jazz in Canada. This dynamic performer has been chalking up the airmiles in recent years between tours with the award-winning BROWNMAN ELECTRYC TRIO and global guest appearances with luminaries such as Paul Simon, Quincy Jones, Jay-z, Missy Elliot, Pavlo and many others. But all the globe-hopping hasn't made him forget his passport says Canada on the front! Trane Live Events, Caliban Arts Theatre & Remix Lounge are proud to have one of the country's jazz iconoclasts -- accompanied by an all-star cast of some of Toronto's hottest top-shelf 20-somethings as side-men -- at the helm of a New Year's Eve party you won't soon forget! Remember to act before Dec 22 and take advantage of discounted prices!